A new RYE inbound, Ralucca “Ralu” from Romania, has arrived, and each member of our Rotary Club of Sturgeon Bay (“RCOSB”) should “DO IT WITH RALU”! A simple thing that your RCOSB President serves to you is to just get to Sturgeon Bay High School – GO TO A STURGEON BAY GIRLS “JV2” VOLLEYBALL GAME – then for the spike, find another RCOSB member at the game AND/or Ralu’s host family (father, RCOSB member Brian Stephens and mother, Amy Stephens) so you are part of that “cheering for Ralu and Sturgeon Bay” group in the stands. Ralu would certainly notice a larger group, “cheering for Ralu and Sturgeon Bay,” and both Ralu and her team would appreciate our RCOSB support. The home games at the Sturgeon Bay High School for JV2 are all on Tuesday at 5:30 pm (Sept 18; Sept 25; Oct 2; and Oct 9th); hope to see you at one or all of these games. Let’s have some fun and be a fan! If volleyball is not your thing, then volley back with something else that is your thing! Do you have a hobby? Is your family doing something you really like and could add one more (Ralu)? Maybe you and another Rotarian (or another friend and you) are doing something – seeing a play, fishing, eating dinner (at home or out), or doing anything is enough (let Ralu understand our culture). See if Ralu is available and might want to do whatever you do with you. Get to know Ralu a little while she gets to learn about America and its people (you). 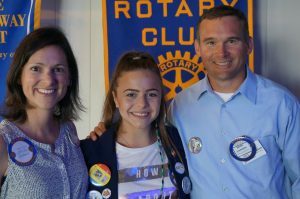 You will certainly be enriched by getting to know this young 15 year old whose family let her come half way around the globe (or is it 1/3rd of the way, or 2/3rd of the way from Romania to Sturgeon Bay). Peace is often built one person at a time! So show Ralu something you love to do, and you both will be enriched. You need to be a RCOSB member supporting Ralu, so do something with Ralu (that also gives our gracious host family some alone time for their own family too). Be a friend, Be an American. Show Ralu our American culture. Make Ralu’s experience here the best that it can be. Whatever you do, “DO IT WITH RALU“ – only you can make it happen. It’s up to you; make yourself a better Rotarian by offering to include Ralu in your life’s activity.